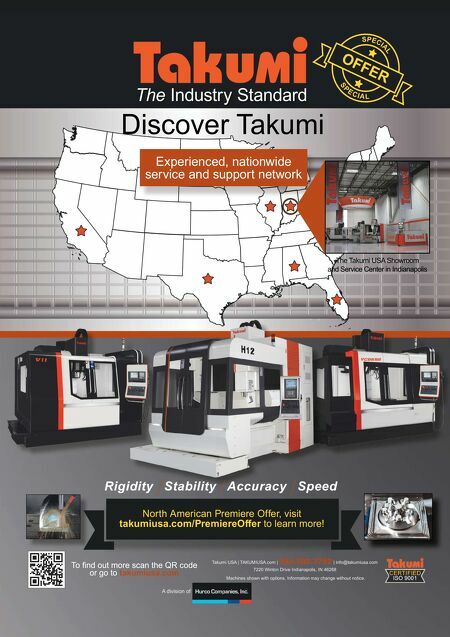 30 MMS December 2016 mmsonline.com RAPID TRAVERSE Machining Technology in Brief when combined with new self-driving vehicle (SDV ) technology, also for their ability to pick up and transpor t payloads around the shop floor, among human workers and completely autonomously. That's the idea behind SDVs like Otto Motors' Otto 1500, which is primarily designed for mate- rial handling but is being developed for other applications as well, including autonomous machine tool tending when topped with a robot arm. The company, the industrial division of autonomous robotics developer Clearpath, currently of fers two SDV models, the Otto 1500, with a 1,500-kg payload, and the Otto 100, with a 100-kg payload. The Otto 1500 can be fitted with a flat plate, cart, conveyor or lift unit. Intended to carry palletized loads, these robotic vehicles can autonomously map their surround- ings for safe, intelligent pathfinding through a facility. Basically, these robots adapt technology similar to the kind used in Google's self-driving cars, but for indoor, industrial applications. In fact, Simon Drexler, the company's director of industrial solutions, says that Otto Motors "is on trend to have more autonomous miles driven than the Google driverless car." Mr. Drexler expects th at e a r l y a d o pti o n of th e O t to c o n c e pt by c u s to m e r s l i ke G E a n d J o h n D e e re w i l l p u t more SDVs in manufacturing and distribution facilities by the end of 2016 than Google will have on outdoor roads. Just as human beings receive data about their environment and form a "mental map" to find their way, these self-driving vehicles take in data using their laser scanners and form a map for autonomous navigation. According to the company, it's as easy as taking the robot for an initial walk around a facility (which means manually control- ling the robot). The Otto 1500 uses two lidar (light detection and ranging) sensors (one on the front and one on the rear) to scan the environment as it goes. "Once it has that reference map, it can freely navigate from any origin to any destination inside of the mapped parameters," Mr. Drexler says. This initial reference map is uploaded to the Clearpath app, enabling users to update, edit and track it. Additional Otto robots use the same map, meaning the initial scanning process need only be performed once. The Clearpath OS is said to enable the robots to move about using only their onboard sensors, eliminating the need for any magnetic tape, bea- cons or additional infrastructure (though some applications might require high-precision targets for docking). The same scanners that build the reference map can also identify objects and people, enabling the robot to safely stop before obstacles and dynamically figure out alternate paths to reach its destination. The Dispatch app, which enables path editing for repeated tasks as well as on-the- fly task dispatch, can be set up on a PC or tablet. The interface centrally manages a shop's entire Otto fleet, providing a point-and-click, drag-and- drop platform for robot orders. The Otto robots carry a NTB 56 safety certifi- cation and are designed with the idea that these will serve as a form of mobile collaborative robot, not just a point-A-to-point-B currier. 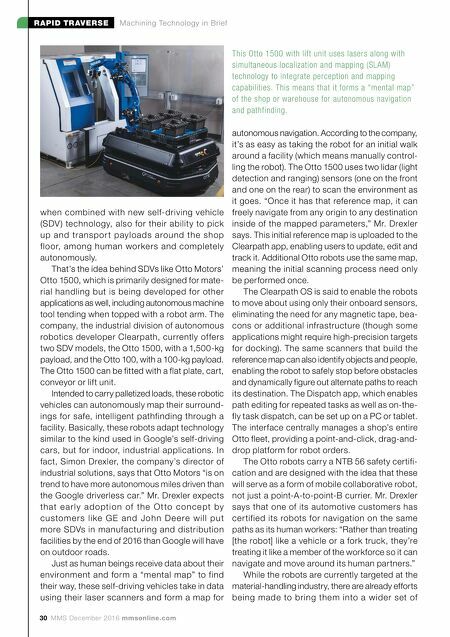 Mr. Drexler says that one of its automotive customers has cer tified its robots for navigation on the same paths as its human workers: "Rather than treating [the robot] like a vehicle or a fork truck, they're treating it like a member of the workforce so it can navigate and move around its human partners." While the robots are currently targeted at the material-handling industry, there are already efforts being made to bring them into a wider set of This Otto 1500 with lift unit uses lasers along with simultaneous localization and mapping (SLAM) technology to integrate perception and mapping capabilities. This means that it forms a "mental map" of the shop or warehouse for autonomous navigation and pathfinding.